Understanding of the barriers to seeking help and treatment for gambling problems remains limited. Research has thus far focused on either the barriers or motivators for help-seeking. This interview-based study investigated both barriers to treatment and the help-seeking process. Three help-seekers types were identified: individualistic, multi-problematic and family-centric. Individualistic help-seekers emphasise psychological reasons as the major barriers to treatment but also see themselves as key actors in the help-seeking process. In this group, a rock bottom experience characterises the final stage of converting intention into action in help-seeking. Multi-problematic gamblers have other major problems apart from gambling, and they may feel that gambling, even if problematic, has a positive impact on their lives and hence lack motivation to change. For them, the need for change comes from improvement in their life situation. For family-centric help-seekers, the reasons for not seeking help are linked to individuals or are treatment- or cultural-related. In their help-seeking process, family members play a crucial role. These results indicate that, to offer more effective help, we should recognise dissimilarities in problem gamblers’ experiences of barriers to treatment and in the phases of their help-seeking process. Author declares that she has no conflict of interests. All procedures performed in studies involving human participants were in accordance with the ethical standards of the institutional and national research committee and with the Helsinki 1964 declaration and its later amendments or comparable ethical standards. Anderson, S., Dobbie, F., & Reith, G. (2009). 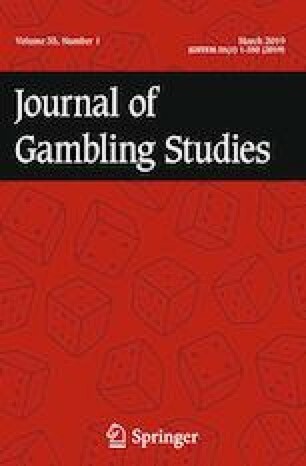 Recovery from problem gambling: a qualitative study. http://www.austgamingcouncil.org.au/images/pdf/eLibrary/19372.pdf. Accessed 23 Oct 2018. Bulcke, G. M. (2007). Identifying barriers to treatment among women gamblers. Doctoral Dissertation. University of Pittsburgh. http://d-scholarship.pitt.edu/10251/. Accessed 1 Nov 2017. McMillen, J., Marshall, D., Murphy, L., Lorenzen, S., & Waugh, B. (2004). Help-seeking by problem gamblers, friends and families: A focus on gender and cultural groups. ANU Centre for Gambling Research. https://openresearch-repository.anu.edu.au/handle/1885/45186. Accessed 23 Oct 2018. Tremayne, K., Masterman-Smith, H., & McMillen, J. (2001). Survey of the nature and extent of gambling and problem gambling in the ACT. http://www.gamblingandracing.act.gov.au/Documents/SurveyofProblemGamblingintheACT.pdf. Accessed 29 Jan 2010.